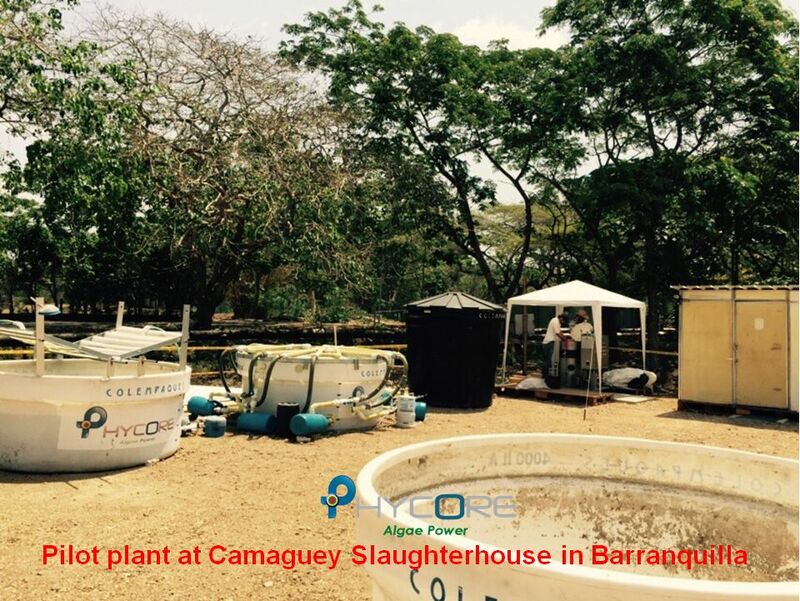 Phycoremediation - Pollutants removal capability at the Slaughterhouse pilot. For the pilot of the slaughterhouse the measurements were concentrated on the organic load indicators. Biological and chemical demand of oxygen (BOD/COD), as well the presence of fats, solids, nitrogen, coliform bacteria and sulfides was tested in the raw and algae treated effluent. The results showed a remarkable capacity of the phycoremediation to reduce the organic load (> 90%), the sulfides (100%) and the presence of coliform bacteria (100%). The ammoniacal nitrogen was reduced between 78.03 and 98.22%, and the total nitrogen 83.42 and 96.94%. The presence of solids decreased between 63.61% and 100%. The fats were removed in percentages higher than 73.81%. Table 2 and Fig. 5 exhibit these results in detail. Biomass gross Calorific value (GCV). The residual biomass of the remediation of the slaughterhouse effluent presented GCV values between 3,436 and 3,831 Kcal/Kg of dry weight.